Held, written by Kelly Maxwell, was a musical fantasy alright. 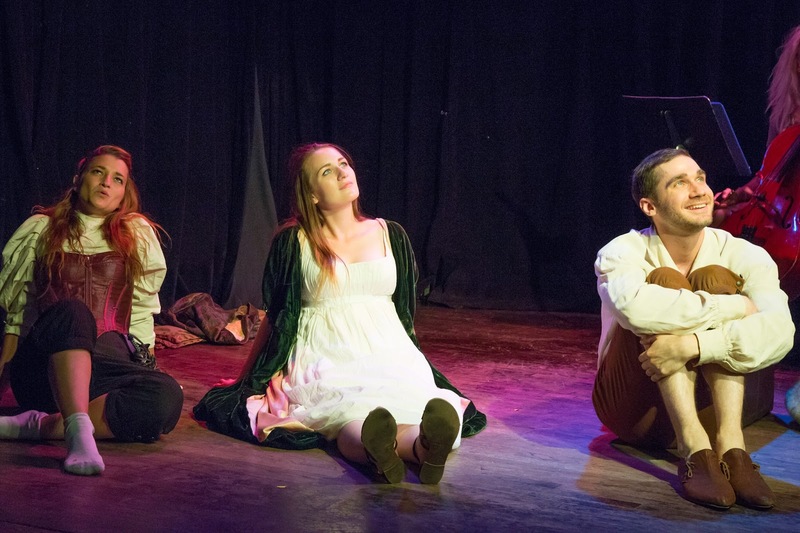 Set in the cabaret style venue of Drom, this dark yet flirty musical was a solid attempt. The plot revolved around Korin, played by Hannah Ripp-Dieter, a “dreamer” that can fulfill others dreams. The downside of this amazing talent is that everyone eventually leaves her to pursue these dreams and she refuses to be abandoned by her only friends, Mera and Bardo. Mera, played by Katie Bakalars, is a warrior and her dream is to fight for her town and families’ honor. Bardo, played by Alex Van Handel, is a goofy yet endearing friend that is a baker and is in love with Korin. So what does one do if she doesn’t want to be alone? Korin builds a wall and claims that it was a sorcerer who has trapped them. The only way out is for Korin to die. Will her friends kill her to escape? The best part of Held was when the cast of three was singing. All three had gorgeous voices and the harmonies were flawless. There should have been more of it for this reason. The opening song, while sung beautifully, was a bit confusing. It did not set up anything for the audience – since no one knew the plot yet, it was confusing to hear the end of the plot sung at the beginning. It was clear what the attempt was, but a song that set up the characters and their purpose for being in front of us would have served the audience more. Held was a mix of "The Giver" meets "Game of Thrones" meets No Exit. The plot had its flaws, but the music (written by Meghan Rose) performed by the live pianist, bassist and cellist was remarkably beautiful. The plot’s biggest flaw was that the character Korin was not likeable from the beginning; it emerged too quickly that she was unhappy and jealous of her friends. The writer could have developed the story a little more – make it more apparent why the audience should like Korin. The director, S.C. Lucier, utilized the entire venue which was fun to watch. Since it was a cabaret style room with spread out cocktail tables, it was a delight when the cast ran through the audience. Some of the locations were revisited throughout the show, like the stream, but these could have been identified a bit more. Material could have been used for the stream as well as other props the actors could have handled to better identify time and place. Since the director had such beautiful actors and music, each piece of staging should have been a picture and instead it was a little unclear and static at times. The costumes, by TDF Costume Collection, made each character easily identifiable and they were beautiful. The idea of utilizing the tools provided in the theatrical community is brilliant. The lighting was simple. Since there was hopping back and forth between times and place the lights certainly could have been better utilized with color, type of lighting and light/dark. It seemed to be a general wash the whole time which made it a bit confusing at times when the actors were in a different time or place. The actors were remarkable singers, but since the plot developed so quickly, it was hard for them to grasp their characters it seemed. It is not a bad thing for an audience member to want more plot. Held was musically beautiful, but left the audience wanting more…more plot development, more character development and more of a punch on those important lines/moments. It should certainly be done again, maybe added to and directed with more importance. Korin was made to be the main character, but maybe it is more of an ensemble piece. It would definitely be worth another viewing.